High school students attending the Congressional Student Leadership Conference on Global Business & Entrepreneurship got to visit the Fox Business Network in New York where they received a first-hand look at what it takes to succeed in business. 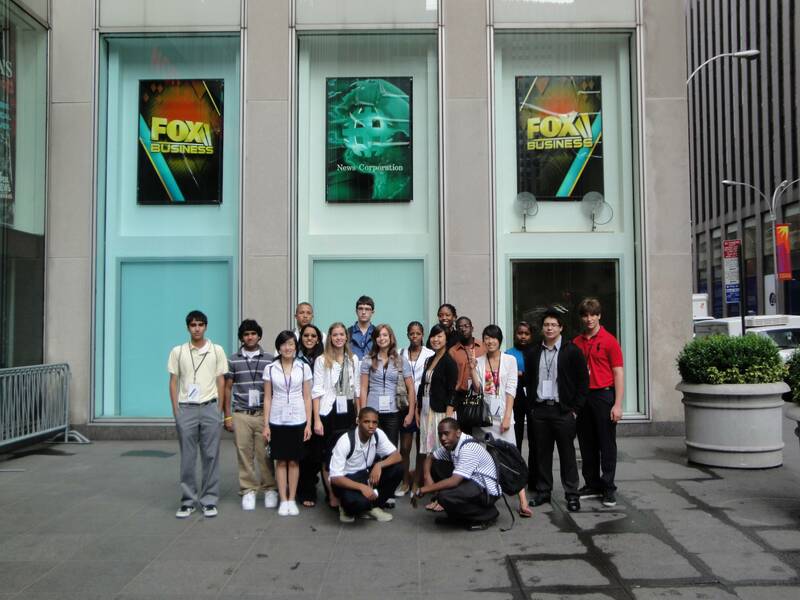 Students enrolled in LeadAmerica's Congressional Student Leadership Conference on Global Business & Entrepreneurship visited the Fox Business Network in Manhattan while attending the 10-day youth leadership conference. Students got to see a live control room, the Fox News newsroom and stand on the Fox Business Network set. They spoke with people from all areas of the network including on-air personalities, production, and the technical aspects of television. Students heard presentations by Brian Jones, Fox Business Networks Senior Vice President for Operations, Ray Hennessey, Managing Editor and Director of the Network's website, and Liz Claman, Network Anchor. The executives spoke about the similarities between starting ones own business and launching a new network, the qualities they look for when hiring individuals to work for the company (mainly 'attitude'), and the importance of the American teenager to advertisers and to the future of media. "Visiting Fox Business Network was an eye opening experience," said Jose Vincente Poblete, 17, one of the students attending the youth leadership conference from Ohio. "It opened my horizons to the world of what goes on in a news network. My favorite part of the trip was taking time to talk with the anchors because they laid down the process of how they got to where they are now. I learned that the journey to success is the most valuable part rather than the actual achievement." LeadAmerica sponsors youth leadership programs for high school and middle school students. Each of its high school conferences is college-accredited and its programs are approved activities of the National Association of Secondary School Principals. LeadAmerica sponsors the Congressional Student Leadership Conference http://www.lead-america.org/conferences/cslc/default.asp for high school students, the National Junior Leaders Conference http://www.lead-america.org/conferences/njlc/default.asp for middle and junior high school students, and Ambassadors Abroad http://www.lead-america.org/conferences/ambassadorsabroad/default.asp international study programs in Europe and Australia. Further information on the Congressional Student Leadership Conference on Global Business & Entrepreneurship and other LeadAmerica youth leadership programs can be found at http://www.lead-america.org or by calling 1.866.FYI.LEAD (394.5323).